The elderly, pregnant women and people with injuries can access the water easily after Lake Bolac Pool staff worked with a specialist manufacturer to design new steps that fit the pool’s unique shape. In the first 12 days after they were installed in mid-December, more than 700 people visited the pool with the new steps constantly in use by a majority of swimmers. Ararat Rural City Council CEO Dr Tim Harrison said Lifeguard Karen McIntyre worked with Australian manufacturer Paramobility to design the steps especially for the pool, which was built in 1980. “The Peter O’Rorke Memorial Lake Bolac Pool was never built with steps and previously only had two narrow steel ladders, which made access difficult for many people,” Dr Harrison said. “The steps are a welcome addition as now a whole new group of patrons can access the water more easily. The steps are suitable for the elderly, pregnant women, those with injuries, and children and adults who are not confident swimmers and want to enter the water gradually. Dr Harrison said more than 1300 people have swum at the pool so far this season, the best attendance figures for many years. 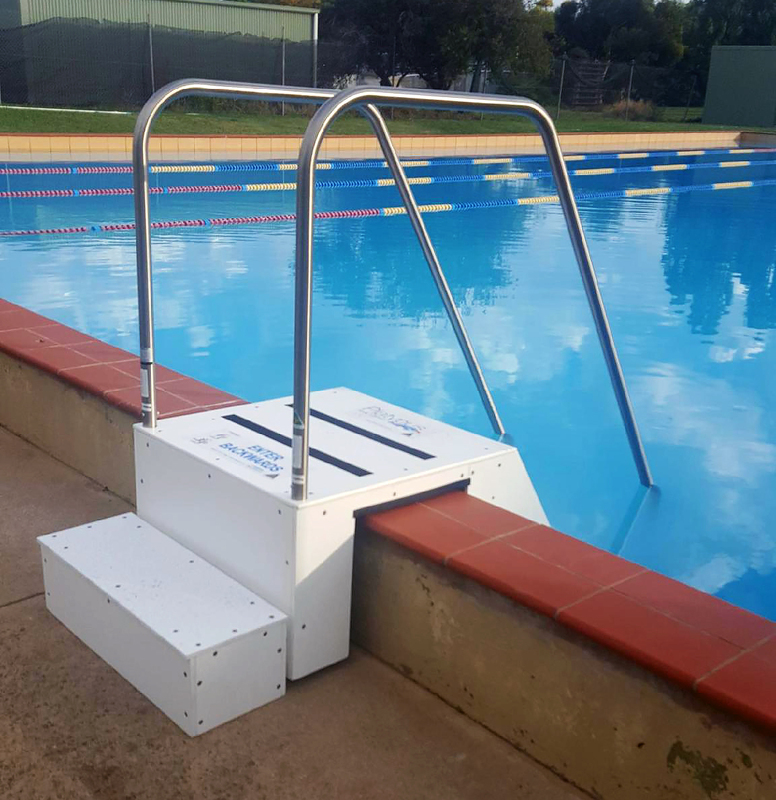 The pool steps project cost $10,000 and was jointly funded by Ararat Rural City Council and Unified Community Sports and Leisure, the company that run the pool. Everyone is welcome to visit the solar-heated pool, which has shade, green grass for picnics, pool toys, ice-creams, and a toddler pool. There will be a free open day at the pool on Australia Day, this Saturday 26 January from 1pm-7pm, with free entry and free activities including a barbecue, tea and coffee and a live DJ.